You would think there were only a few different ways a touch screen smartphone could be made to look, given most of what you see is just screen, but it is clear when you look at some of the devices on the market that there are definite winners and losers in the aesthetic design category when it comes to mobile handsets. The HTC Sensation is a phone that has been around since mid 2011, and has been noticed by a lot of reviewers and consumers for its stand out looks. Here we take a look at what makes the Sensation stand out. While iPhones have become progressively less curvy and more hard edged, other manufacturers like HTC still retain curvier, smoother lines in some of their models. The curves on the Sensation by HTC even look like the glass itself is curving into those smooth shapes around the front, giving this handset an unbelievably sleek look. The shape and design also makes what is actually a pretty large phone look smaller and less bulky, and makes it feel very comfortable in your hand. If you are someone who likes to do most of your phone tasks one handed, this is one of the few larger devices where this is easy enough for most people. 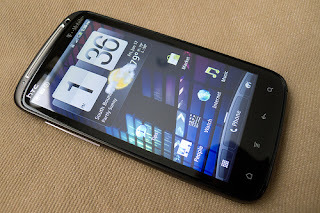 One of the most interesting parts of the HTC Sensation's design is the styling on the back of the handset. This comprises three shades of grey, two made of plastic and one of metal, with some chromed details. This looks cool and also gives the phone a sense of quality – the plastic and metal feel well made and well put together, and if you remove the back to access the card slots and battery it comes off and goes back on easily, without that sense that something might snap or crack that you get with cheaper phones. It is a good looking but subtle phone, which looks really nice and differentiates itself from other models, but doesn't look like a quirky style statement. When it comes to the screen itself, the size and quality are both excellent. The HTC Sense interface, which is already very good, looks absolutely fantastic on the large, clear screen, and you will find watching video, viewing pictures or reading to be a joy on this device. Speaking of pictures, the 8 megapixel camera on the Sensation is also extremely good, with a great LED flash that works very well when photographing with minimal natural light. All in all, if you are conscious about how your phone looks and want one that is attractive but doesn't give too much away with bold colours and unusual design decisions, the HTC Sensation is a great choice, and the screen, camera and other hardware features are all of a really great standard. If you want a new Android phone at a price that won't break the bank then you should definitely consider this model when you are choosing. The post by Laura Ginn, who is a technology and mobile phone writer, takes a look at the smart HTC Sensation Android smartphone. Laura loves testing and reviewing all of the best offerings from big names in mobile tech like HTC, to help readers find the best products for them. I love my Phone over the years I have had many a great Phones but this is the best one yet in my opinion! Great list for people on a budget though! These days I go for contract phones as you always get the Best Phone for free or at least very cheap! Thanks for sharing. HTC is the best smartphone that gets all the important elements right now.Design with imitating..